The viewing studio has been designed to create a comfortable and professional venue for all your research and business needs. 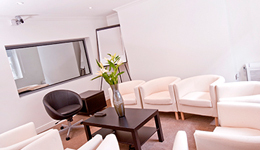 The facility can be hired by room, by floor or full house hire depending on your requirements. As we offer fieldwork services we can organise your research and viewing facilities in one complete package. Our on-site manager will ensure your project runs smoothly from audio/video technology, room temperature to catering for you and your clients. The meeting room facilities provide a business-like yet comfortable environment for a wide range of off-site management meetings, including brainstorming, creative workshops, training seminars and interviewing. The facilities include state-of-the-art audio and wifi equipment to air conditioning and office administration requirements when required. The ground floor with two meeting rooms is an ideal location for pre-recruiting Hall Testing or interviewing. Our kitchen can provide oven, grill, sink, microwave and fridges. With many top restaurants and bars within a five minute walk we can cater for lots of different client food requests. Food can be served any time in any of our meeting/viewing rooms. We are located in central Dublin just minutes from Stephen’s Green, Grafton Street and within walking distance from many Dublin hotels. We are opposite the famous Seafood bar and grill, Matt the Threshers. All public transport is within easy access (Luas, Dart and bus) and we have access to free on street parking after 7pm.